Dr. Brewer and the team of Dr. Brewer and Associates are excited to let you know that during your next visit to our optometry practice, you will experience the benefits of the latest advancement in primary eyecare – the iWellnessExam™. The iWellnessExam uses breakthrough technology called spectral domain optical coherence tomography or SD-OCT. Similar to an MRI or CT scan, the iWellnessExam captures high definition cross sectional images of your retina, which is the back of your eye, and allows Dr. Brewer to see in unprecedented clarity what may be invisible with traditional examination methods. Many eye problems can develop without warning and progress without symptoms. In early stages, you may not even notice a change in your vision. But sight threatening conditions and diseases such as macular degeneration, glaucoma, diabetic retinopathy and others can be detected with a thorough evaluation of the retina, including the iWellnessExam. 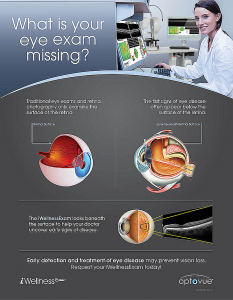 A detailed SD-OCT scan report to show a healthy eye or detect very early signs of disease. A retinal thickness map and ganglion cell complex assessment giving your doctor detailed information simply not available with other methods. The opportunity for you to view and discuss your iWellnessExam report with your doctor at the time of your exam. A permanent record for your file, which allows Dr. Brewer to compare your iWellnessExam reports each year to look for changes. At Dr. 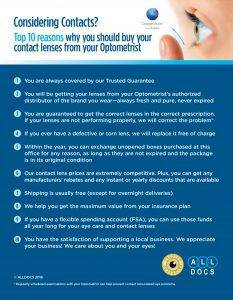 Brewer and Associates in NE Philadelphia and North Wales, we are dedicated to providing our patients the best eye care possible and the iWellnessExam helps us achieve that. Clarifye is a multi-faceted eye exam which provides the most accurate, patient-friendly eye exam.